This superb old wooden canister came from the the home of a former British Colonial District Officer, who began his career in East Africa before WWII. Bowl is beautifully made in wood. 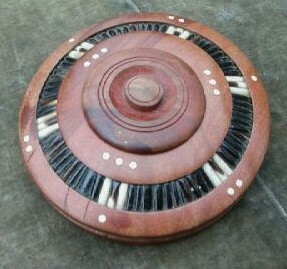 The top measures approx 15cm across with inset quills & ivory/bone dots on the top and sides. The top lifts to reveal a little storage recess.